Over the Rainebeau: Aloha, Pink Hotel, Lu'au oops, and Bitty Book Necklace! 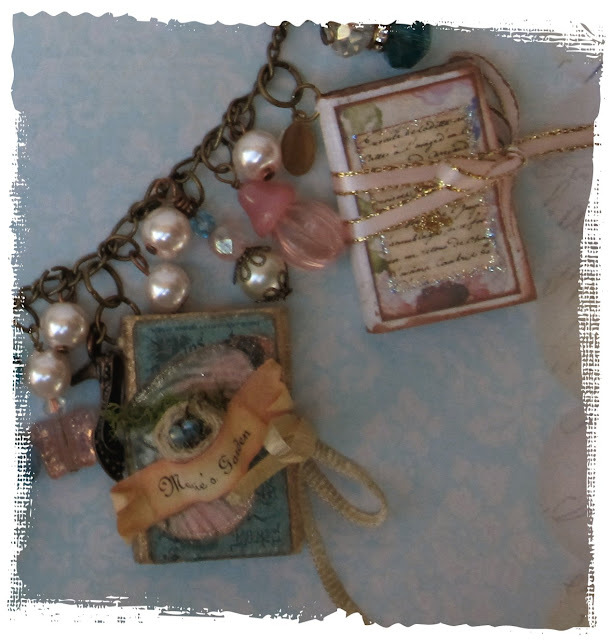 Aloha, Pink Hotel, Lu'au oops, and Bitty Book Necklace! Yes, I have been on vacation. sipping a pina colada with my toesies in the sand. and therefore insisted we stay in a PINK hotel! Just so I could blog about it, lol! 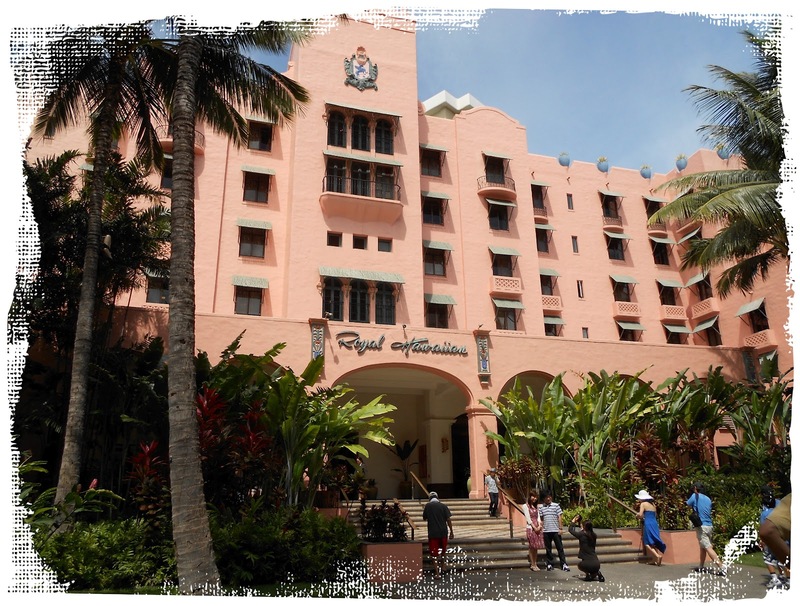 the very lovely, historic Royal Hawaiian in Waikiki. Aaargh! Right at the start of the vacation! you may already know that I am very hard on cameras. and bought a new camera when we got to the Big Island. I just love the Big Island. one or two or more weddings when you're in Hawaii. and figured they would have a pretty good one, so we decided to give it a try. tiki torches, a lovely buffet, and everyone was so friendly! we thought, wow, this is sooo nice!! and realized that we were at some wedding couple's rehearsal dinner!! LOL!! In our defense, there were at least 100 people there....who knew? And we missed the real lu'au because we spent so much time at the RD. 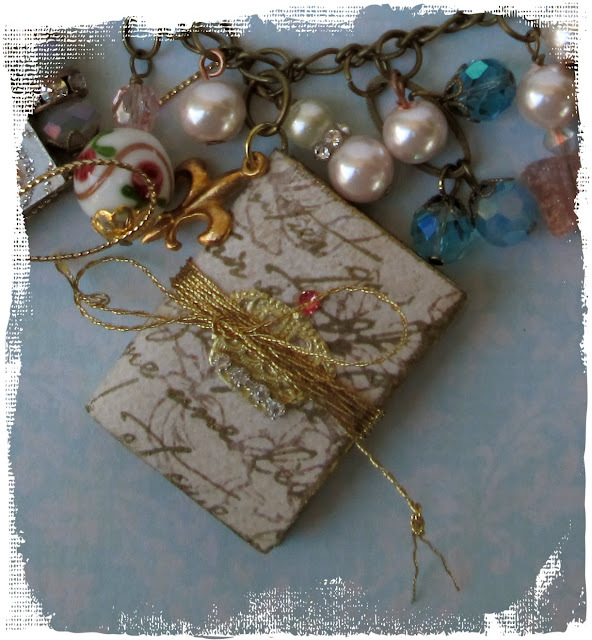 I do have a lovely collaborative bitty book charm necklace to share with you. recently hosted a swap in the Marie Antoinette Mail Art group. Each ties shut and has a dangly charm at the top. 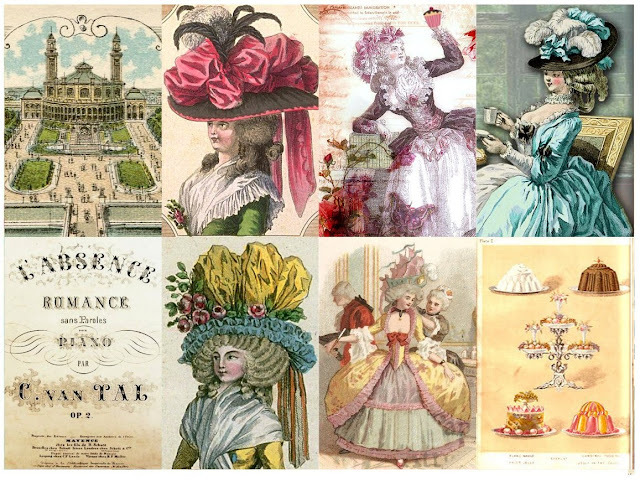 The inside pages are Frenchie/Marie images. Do you even see how Robin made a teeny weeny birdnest with two pearl eggs in it? I used gold embossing powder for the French wording and edges of book. embellished with rhinestone chain and pink crystal. I just love this group! Thank you so much, Robin!! And thank you Marti, Terri, and Lisa!! 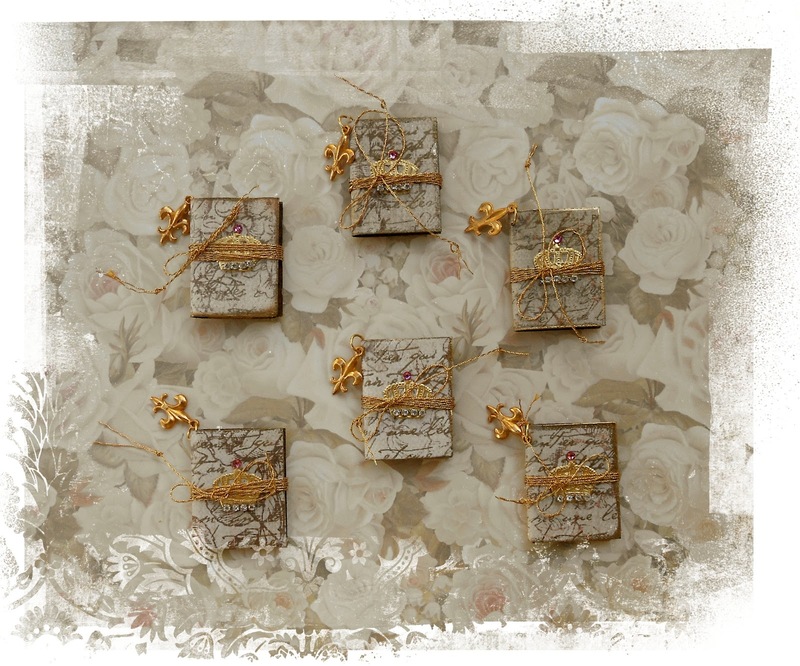 OK, so you may be thinking...but what's inside these bitty books? Holding the little books open and snapping a pic proved too much of a challenge for me. 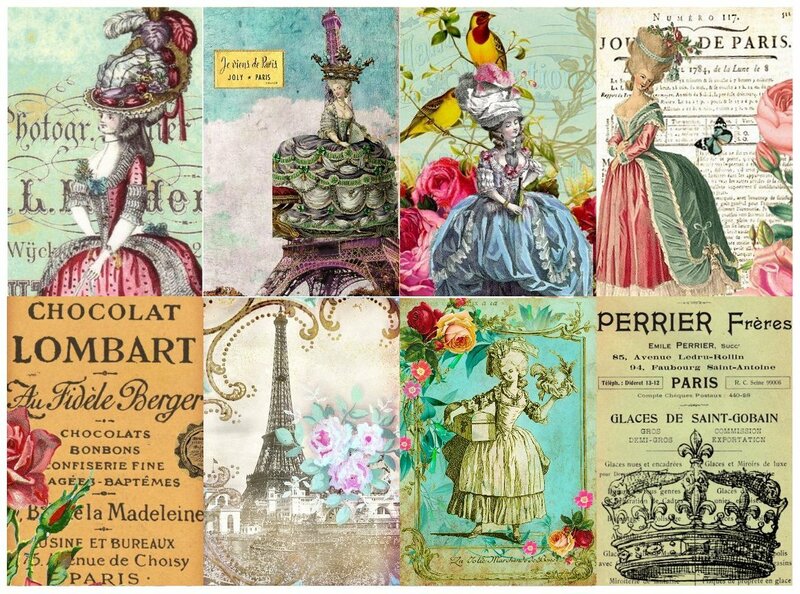 each little image would be pasted onto one of the ten pages in the book. 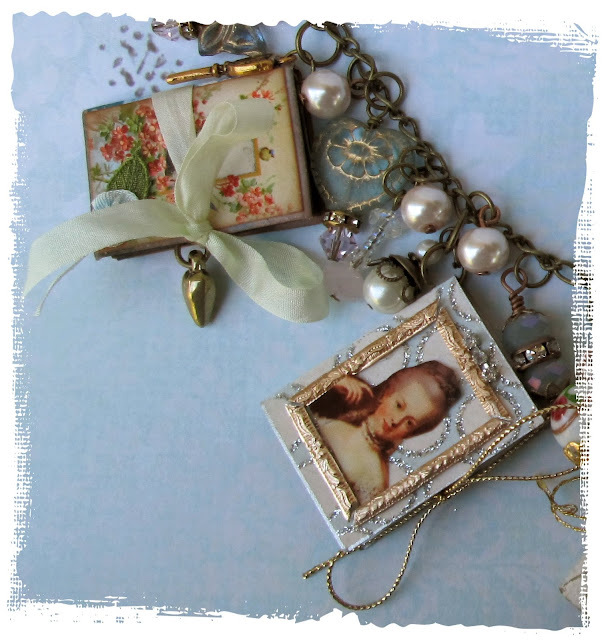 Check out Robin's blog for inspiration! Or use for charms, etc. Oh you made me LOL ! 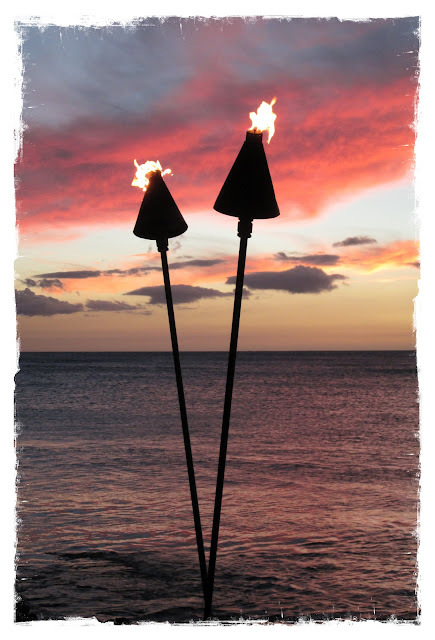 When we went I had to "do" a Luau as well ( but we did go to the one put on by the hotel) I'm bettin the rehearsal dinner was much better. as for the swap WOW, absolutely fabulous ! Your bitty book necklace is so fun! The possibilities are endless! I love the Royal Hawaiian - so lovely and so pink! I've never been to the Big Island because I can't seem to stop going to Kauai...it whispers my name over the waves! This is my first visit to your blog but I'll definitely be back! They are too cute.Like that swap!! Oh Lorraine, how hillarious. Reminds me of that movie where people just stop at hotels and go in and eat at dinners and no one knows the difference.!!!! I adore the little books--very unique, delicate work. The freebies are so pretty. Might have to give it a try. Thanks for stopping by my little corner of oz today. Bummer about the camera! But that hotel awesome! And beautifal necklace! Well Lorraine, thanks for the best laugh today. We went to a real Luau when we were in Hawaii. I mean the real thing. Your story made me laugh out loud. I love your swap and pics so much. I just did two journal pages about Marie Antoinette. Last weeks PS post. Your bitty books are charming. Don't you just adore Hawaii vacations! And that is so cute about the lu'au ... really quite good food is served. The pig roast is deelish We've actually dined at the natives in the country 'real' lu'au, had a blast. The bracelet & charms are just wonderful. How creative. What a Great story. I hope you met the bride and groom. HAHAHAHHAHAHA! Your necklace is exquisite. I want to learn how to make those little books!!! I just love all your pretty creations. How does one get invited to the Marie trading group? I would so love to partake. I adore Marie! So glad I stopped by. Wow! I am in awe of how you and your swap friend fingers must have such dexterity! I cant imagine getting my sausages to maneuver such delicate creations! Very lovely! Enjoyed your post. What a lovely vacation and funny story! 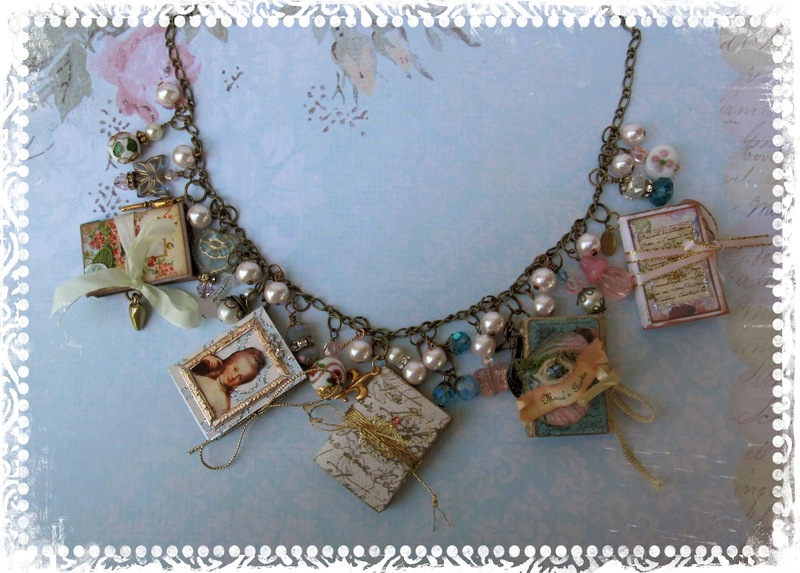 The book necklace is just adorable! What nice swap!